Your whole team benefits when you sink a long putt in an Ambrose competition. An Ambrose tournament is a way of formatting a scramble. It was named for a Michigan couple, Richard and Mary Ambrose, who in the 1960s taught the format to local golfers in Australia, according to the website of the New South Wales (Australia) Office of Environment and Heritage. In an Ambrose event, every team member tees off, then one ball is selected as the location for the team’s second shot. Each golfer then places a ball within a specified length of the chosen ball and plays from that spot. Play continues in this fashion until the team holes out. The Ambrose handicapping method is to help equalize the teams. Look up each player’s course handicap. The United States Golf Association notes that the course handicap is found on a chart posted at most courses. Each player finds his handicap index on one side of the chart and reads off his corresponding course handicap from an adjacent column. Add the handicaps of all team members, then divide the total by twice the number of players on the team. For example, if a four-player team’s handicaps add up to 42, the team’s handicap is 5.25. Team handicaps may be rounded up or down to the nearest whole number, or decimals may be used. Subtract the team handicap from the team’s gross score at the end of the round. 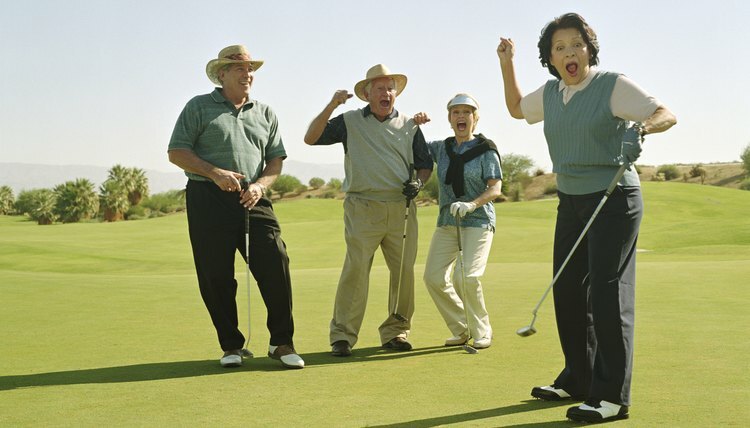 If a team shoots 70, and its handicap is 5.25, the team’s final net score is either 65 (if handicaps are rounded) or 64.75 if decimals are retained.